Alexsandar Mitrovic continued his impressive goal-scoring form as Sheffield Wednesday lost 1-0 to promotion-chasing Fulham at Hillsborough today. The Serbian international slotted home in the 78th minute from inside the six-yard box after Ryan Sessegnon broke down the left hand side and sent in a peach of a delivery. It was Mitrovic's ninth goal in his last nine Championship appearances. In truth, the Cottagers could have won by a far bigger margin had it not been for the excellence of Owls shot-stopper Joe Wildsmith. The academy graduate pulled off a string of fine saves. The result extended Fulham's club-record unbeaten league run to 19 matches and moves them to within two points of second-placed Cardiff City. As for Wednesday, Jos Luhukay's troops remain in 16th position with five matches left to play. 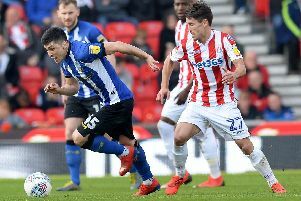 Luhukay made one enforced change to his defence as they chased a fourth straight win, bringing in Daniel Pudil for the injured Morgan Fox. Pudil missed the Easter Monday trip to Sunderland due to a hamstring injury. It was promotion-chasing Fulham who had the first sight of goal when full-back Matt Targett dragged a shot well wide from long range after good play by lone striker Aleksandar Mitrovic. Sheyi Ojo, the visitors only alteration from the team who defeated Leeds United 2-0 in midweek, slid in to convert Kevin McDonald's low cross in the 11th minute but the strike was disallowed for offside. There were some decent passages of play by Wednesday in the early stages but Fulham looked more likely to break the deadlock, with Ojo's weak attempt comfortably kept out by Joe Wildsmith. Midway through the half, Mitrovic brilliantly pulled the ball back from the byline for teammate Ryan Sessegnon and the highly-rated Cottagers winger saw his looping header clip the crossbar before going over. The visitors continued to dominate possession and McDonald's right foot effort from outside the penalty area was expertly turned away by Wildsmith. Things did not get any better for Wednesday on the half hour mark when Barry Bannan was forced off with an injury. The frustration was etched all over Bannan's face as he was withdrawn, with Jacob Butterfield replacing him in midfield. Moments later, Target whipped in a delivery across the face of goal which just evaded Mitrovic in the middle. Lucas Joao deftly back-heeled the ball into the net following lovely link up play between Butterfield and Pudil but the goal was disallowed for offside. Pudil glanced over Joey Pelupessy's corner in the dying embers of the first half as the Owls pressed for the opener. However, Wildsmith came to the home side's rescue in the 43rd minute, producing a superb save from point blank range to tip over Mitrovic's bullet header after great play down the right by Ryan Fredericks. It got a little scrappy in the second period. Butterfield freed Adam Reach and he burst forward at pace before drilling a left foot shot wide when well-placed. Pelupessy floated in a teasing free-kick into the danger zone which was headed down by Nuhiu into the path of Frederico Venancio, who fluffed his lines from close range. An offside flag spared Venancio's blushes. That stirred Fulham into life and Mitrovic powered over a Targett corner before McDonald blazed over after collecting a neat pass by Fulham skipper Tom Cairney. Neeskens Kebano almost made an instant impact after replacing the injured Floyd Ayite, slipping in Stefan Johansen and the Cottagers midfielder forced Wildsmith into action at his near post. Luhukay turned to his bench for inspiration late on, throwing on Fernando Forestieri at the expense of Joao. After Mitrovic's poacher's finish, Kebano could also have got on the scoresheet but he fired over Johansen's shot free kick. Kebano spurned two other great opportunities to add to Fulham's lead and Forestieri almost punished them at the death. The talismanic forward curled over after good approach play by Pudil and Reach. But Fulham held on for three vital points to bolster their automatic promotion aspirations. Owls: Wildsmith; Venancio, Lees, Pudil; Hunt, Pelupessy, Bannan (Butterfield 30), Reach, Boyd (Matias 86); Nuhiu, Joao (Forestieri 76). Substitutes: Dawson, Thorniley, Jones, Rhodes. Fulham: Bettinelli; Fredericks, Odoi, Ream, Targett; McDonald, Johansen, Cairney; Ojo (Ayite 62, Kebano 72), Sessegnon, Mitrovic. Substitutes: Button, Kalas, Christie, Norwood, Kamara.